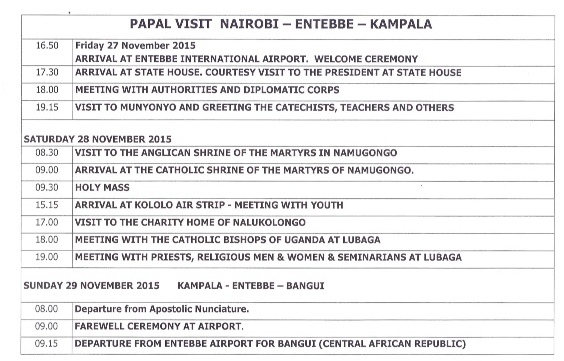 The Official Papal Visit programme of the Holy Father’s visit to Uganda was released on Saturday, 17 October 2015 by the Apostolic Nuncio to Uganda and announced by the Secretary General of Uganda Episcopal Conference, MSGR John Baptist Kauta, at 1.00 pm on radio Sapientia. In a statement sent to media houses on Saturday October 17, Archbishop Blume, the Apostolic Pro-Nuncio to Uganda, said the pontiff who will fly in from Kenya will spend 40 minutes at the airport and then head for a half-hour meeting with President Yoweri Museveni at the Entebbe State House. About 1000 people are expected at the airport to receive Pope Francis, who after meeting President Museveni, will drive to Kampala while making expected stop-overs to wave and bless pilgrims along the highway. They will assemble at Bugonga Parish from where they will be transported to the airport. Forty (40) Christians from each of the nineteen Catholic dioceses in the country, eighty members of the organising committee and another 200 guests comprising journalists, government officials and Entebbe municipality residents will receive the Pope on arrival. Officials expect the 760 representatives from the dioceses to wear traditional attire to give colour to the welcome event.